The Saturn Floppy Disk Drive (Saturn FDD) peripheral is an add-on to the Sega Saturn console, allowing for data to be saved to commercially-available 3.5-inch floppy disks (MF-2HD). It was only released in Japan, debuting on July 27, 1996, for ¥9,800. The floppy disk drive connects to the Saturn using the console's rear extension communication terminal, however requires its own AC adaptor to function. Also included in the package is a FDD Operator CD-ROM, allowing users to manage data. Primarily the Saturn FDD acts as a substitute for the console's internal save memory, with a floppy disk offering 50 times more storage for save games or online data. The drive appears to have been planned from the beginning of the Saturn's lifespan, being documented within Saturn development kits and supported through libraries in the Saturn's BIOS, however the peripheral was not released to the Japanese public until mid-1996, and was not widely supported by commercial software. Furthermore Sega appears to have downplayed the Saturn FDD's existence in the later years of the system, omitting it from lists of peripherals. It is now very rare to find working units. 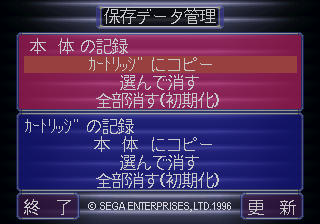 Only a handful of games can communicate directly with the Saturn FDD, such as Panzer Dragoon Saga and Dezaemon 2's shooter construction kit. 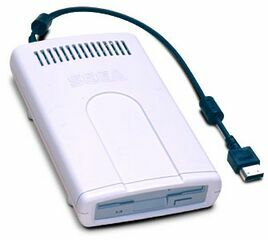 External storage was also offered by Sega in the form of Saturn Backup Memory cartridges, which although can't hold as much data (512kB vs. 1.44MB) and may have worked out as being more expensive in the long-run, ultimately proved more popular. BKUP_ABS.TXT TXT (Abstract) 398 About this game. BKUP_BIB.TXT TXT (Bibliographiced) 20 No message.